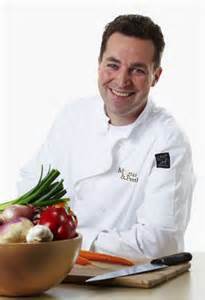 I recently had the privilege of meeting Chef Shawn McCarty, founder of Mortar and Pestle. Based in the Hamilton, Ontario area, Chef Shawn, a Canadian Red Seal Chef, has had an interest in food production, processing and consumption from a young age. After having spent many years in 4 and 5 star rated establishments Chef Shawn now brings his knowledge and enthusiasm for food right to your home! What a perfect idea for a bridal shower or rehearsal dinner! And, Chef Shawn has done many of these events. Leave the food to him and enjoy your pre-wedding celebrations and your guests. But, as he told me, your guests will probably drift into your kitchen to watch him in action. No worries! Chef Shawn is more than happy to have an audience as he explains how he prepares the dishes on his fabulous menus whether seasonal, international or advanced. I love his 2014 spring/summer menu which you can access by clicking here. 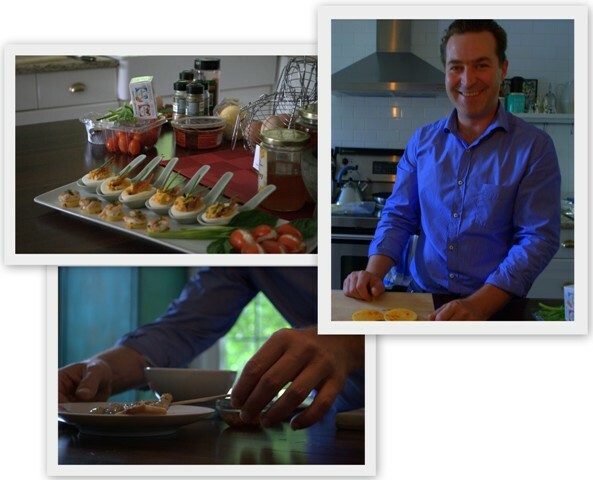 Chef Shawn invited some friends and I into his personal kitchen to see him prepare some of his favourite hors d’oeuvres. No worries if you or any of your guests have dietary concerns. Chef Shawn will be happy to create a menu with many options including gluten free. Chef Shawn made the whole process look so easy! We enjoyed (I should say devoured!) 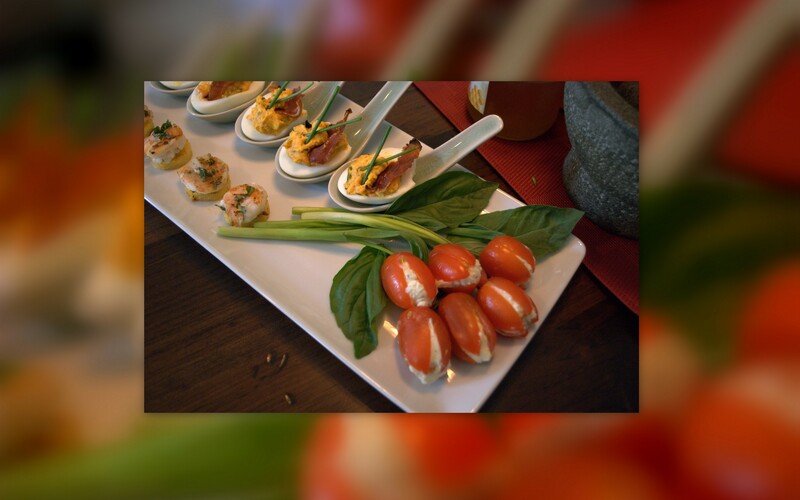 Chef Shawn’s special deviled eggs, tomatoes stuffed with feta cheese and arranged with basil and green onion to look like tulips (love the spring theme! ), and grilled shrimp on bite-size grilled polenta rounds with a spicy sauce. Yum! Whether you and your guests decide to join Chef Shawn in the kitchen for an interactive cooking experience, or relax with your guests in your living room or on your patio, you will enjoy a wonderful meal! Learn new cooking skills and let the folks at Mortar and Pestle do all the work including the shopping and clean-up! 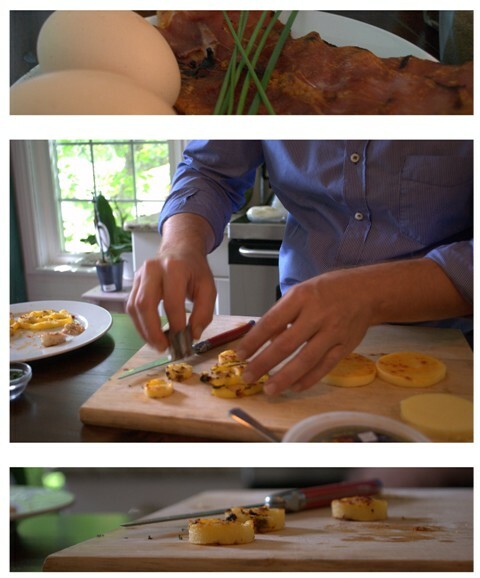 For more about Chef Shawn and Mortar and Pestle visit his website here. You can also watch him on CHCH TV and read about him at the Hamilton Spectator.